Originally I had planned on discussing something concerned with cellular phone use. However, I find myself still so appalled by the case I discussed in my previous post, that I will instead open a discussion about possible ways to avoid bullying by social network users. The main approach today is to attempt to limit use of social networking sites to those over a certain age. Therefore, there are those who are now proposing that age verification be legislated. This article discusses the problems associated with such an approach. The most obvious issue of course is that minors do not have any identification (drivers license, credit card, etc). Any scheme that relies on using a parent's ID is doomed for failure for many reasons, as is discussed in the article. So, now I am putting on my thinking cap. Is it really only an age issue? Wouldn't it be a healthier environment for all if we all knew which are impostors and which are portraying their real identity? Even if we couldn't provide a 100% accurate indication, wouldn't it be helpful to have some kind of indication (real vs. impostor) with perhaps an accompanying reliability score? With my technical background I of course have lots of ideas running through my head about how to provide information that could contribute to a real vs. impostor decision. However, I believe that user input could also be an important source of information. We take into account other people's opinions about everything from books to washing machines before we make a purchase. Perhaps it would be helpful to receive input from others about whether Joe Smith on Facebook is real or an impostor. Please express your views about this, as well as making other suggestions about how you think we can make social networks and the other modern modes of communication safer for our children ... and for ourselves. What you are describing is called "reputation system". It is not only for real vs. imposer, it may serve for different purposes in different communities. 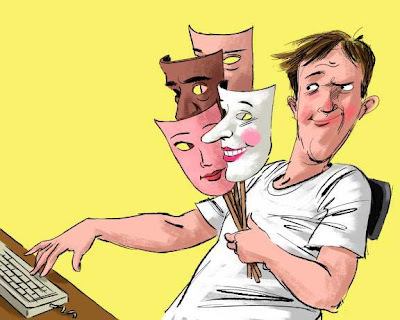 Note that a person may have several identities, some even with fake details, but as long as those identities pose no harm, it does not matter that they impose as others. They may still have reputations as wise, helpful, funny, resourceful, etc. Thanks for commenting. I would be happy to join your discussion about reputation systems. Please leave a link where I can join you.